Kalle Brolin about Sunshine Socialist Cinema CC:BY-NC. 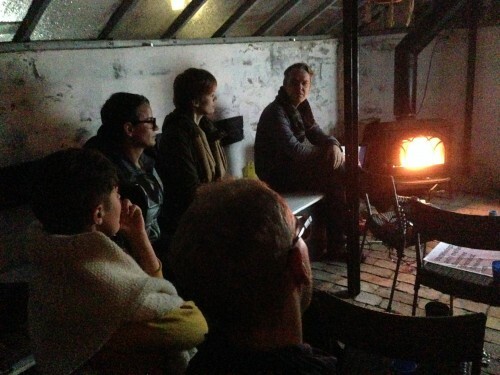 The Greenhouse Artist Talks is a lecture series where artistic practitioners explore and present work related to urban gardening and archives. The greenhouse at Slottsträdgårdens kafé in Malmö becomes a site for research and artistic practice. The series is curated by Veronica Wiman. The greenhouse will be heated during the lectures, but make sure to dress warm. No summer clothes. Zeenath Hasan’s presentation reflected on foraging (searching for wild food resources) as a conscious act of resistance, which is deeply entangled with humans and non-humans in the making of meetings. Hasan is an ethnographer and food entrepreneur based in Malmö, Sweden. Her kitchen project Tapori Tiffins is located in the cosmopolitan district affectionately known to the locals as Möllan. Kalle Brolin and Kristina Müntzing from the Sunshine Socialist Cinema screen films and talk about how films can generate discussions on radical topics. Bonnie Fortune presents a Powerless Powerpoint – a visual display system that considers what it means to power down. Apolonija Šušteršič talks about gardening as a method in the process of production of space. Anna Maria Orru explores the role of artistic research to ‘unearth’ transformed behavior when it comes to food and growing practices. Gunnel Pettersson talks about an art and design project that is based on the cultivation of buckwheat. Learning Site talks about their perspectives of farming, historical time, and spatiality. For more information about the Greenhouse Artist Talks, contact Veronica Wiman.